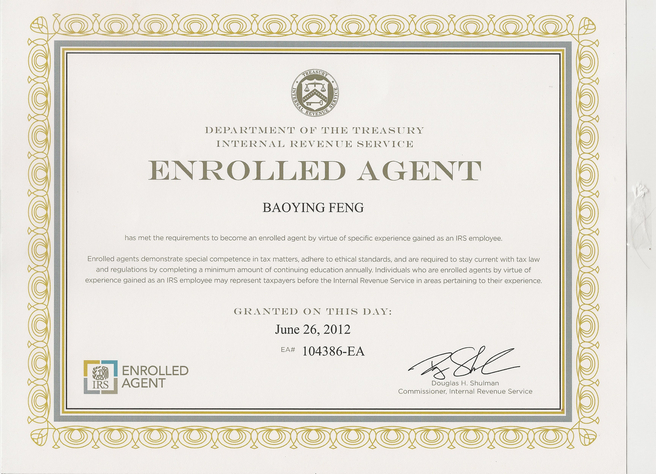 Ms. Baoying Feng is the founder of Reliable Tax Service. She is an IRS Enrolled Agent with over ten years of experience in taxation and accounting services. Ms. Feng provides a wide range of services to individual and business clients, including tax planning and preparation, small business accounting, bookkeeping, and payroll. Reliable Tax Service strives to provide personalized, professional-quality services to all clients. Ms. Feng invests the time needed to understand each of her clients' financial needs and goals in order to extend a level of attention and care that will exceed expectations. Ms. Feng will use her experience and knowledge of tax situations, tax laws, and education to help her clients minimize their tax liabilities and maximize their tax credits. Your satisfaction is her mission!